Of course, there was no criticism of the move on NBC and ABC [although the move is opposed by the affected businesses and many Americans]. Combining Today and Nightly News, NBC on Monday allowed a total of 42 seconds. Good Morning America on Monday managed 14 seconds. CBS skipped the story. KATE SNOW: With the stroke of the President’s pen on this Labor Day, about 300,000 workers will get something many have fought for: guaranteed paid sick leave. 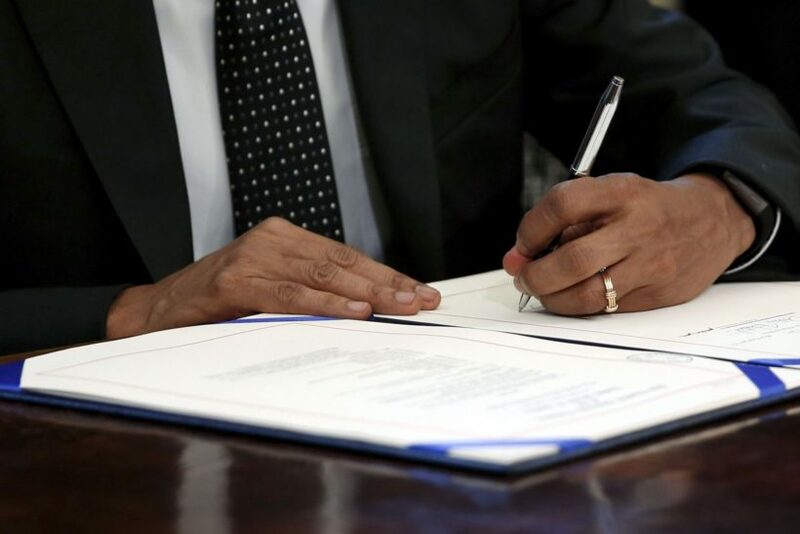 President Obama announced an executive order giving sick leave to employees of federal contractors, among others. Starting in 2017 they’ll get up to seven sick days a year, depending on how many hours they work. SHEINELLE JONES: Taking a look at the headlines on this Labor Day, President Obama signs an executive order affecting hundreds of thousands of American workers. The measure requires that federal contractors give paid sick leave to employees including about 300,000 workers who currently do not receive it. The Labor Department said the cost will be off set by fewer people leaving their jobs and increases in worker loyalty. TOM LLAMAS: And on this Labor Day, President Obama is signing an executive order that requires federal contractors to give employees paid sick leave. The order will affect about 300,000 workers. The President will also call on Congress to extend paid sick leave to private sector workers as well. 3. What type of bias do NBC, ABC and CBS exhibit in their reports on this news story? …Mr. Obama’s executive order on paid leave was his latest use of executive power to change the rules of the American workplace and was designed to appeal to his union base. A fight over trade this year ruptured the usual alliance between the Democratic president and the organized labor movement. Mr. Obama’s assertive exercise of his authority over federal contractors has generated objections from business groups that argue he is going too far and from lawmakers who complain that he is circumventing the legislative process. Critics say he is piling expensive directives onto companies doing business with the federal government as a sop to his political base without accounting for additional costs. The National Federation of Independent Business, while acknowledging that Mr. Obama has the authority to place conditions on federal contractors, said his latest action was another burdensome government mandate on private firms. “No business in America would require its suppliers and contractors to increase costs that will naturally boomerang back in the form of higher prices,” said Jack Mozloom, the federation’s media director. He said any call by the president to follow suit would ignore the fact that most employers are small businesses that cannot afford the benefit. NBC and ABC informed viewers that President Obama signed an executive order on Labor Day mandating federal contractors give paid sick leave to employees and that this order will affect about 300,000 workers. NBC also informed viewers that the Labor Department said the cost will be off-set by fewer people leaving their jobs and increases in worker loyalty. In its news report, The New York Times informed readers that the president’s executive order was controversial: the reporter implies President Obama wanted to appeal to his base – unions – with whom he had had disagreements; that he has used executive order before; that he did it to make the change he’d like to make in all businesses if he had Congressional approval; that business groups are opposed to his actions because they will increase costs for companies and in turn cause higher prices and that most employers are small businesses that cannot afford to pay such a benefit to employees.